eCheck.Net Payments For PrestaShop gateway has been created to make electronic check payments in your online store a standard. Allow Authorize.Net payments and let your clients accept and process their daily transactions with eChecks. 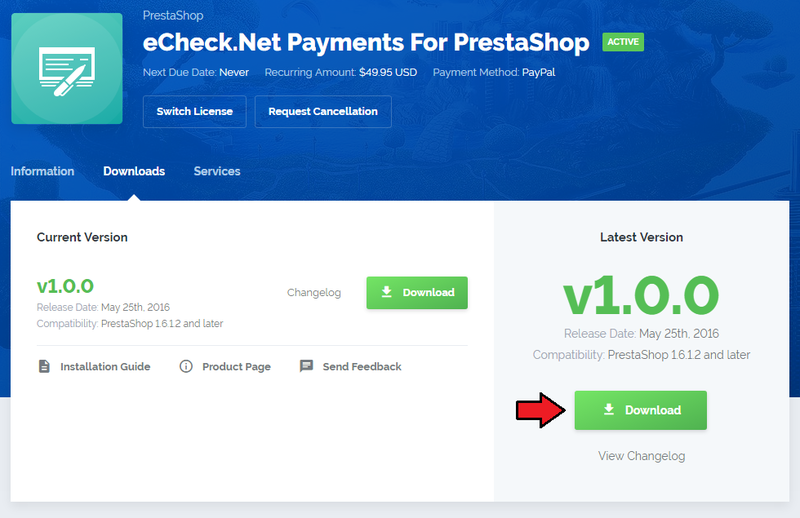 This tutorial will show you how to successfully install and configure eCheck.Net Payments For PrestaShop. 2. Upload and extract the module into the main PrestaShop directory. Files in your PrestaShop directory should look like on the following screen. 3. When you install eCheck.Net Payments For PrestaShop for the first time you have to rename 'license_RENAME.php' file. File is located in 'modules/eCheck.Net_Payments/license_RENAME.php'. Rename it from 'license_RENAME.php' to 'license.php'. 5. Now you have to activate the gateway on your PrestaShop platform. 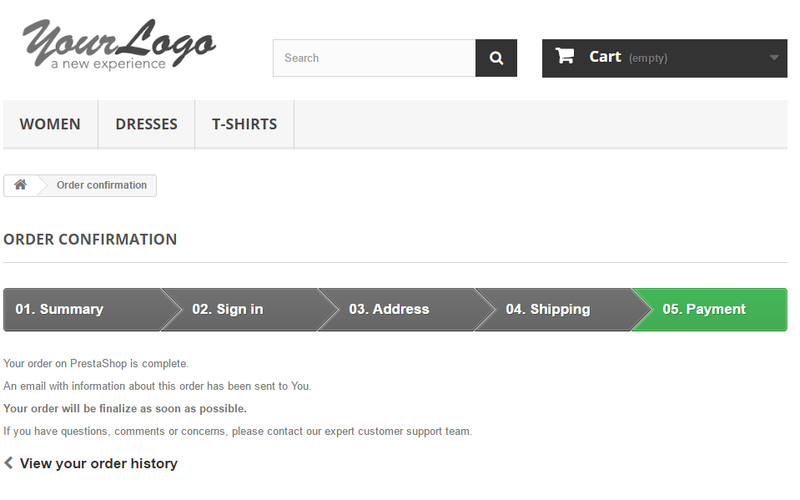 Log in to your PrestaShop admin area. Go to 'Modules and Services' → 'Modules and Services'. 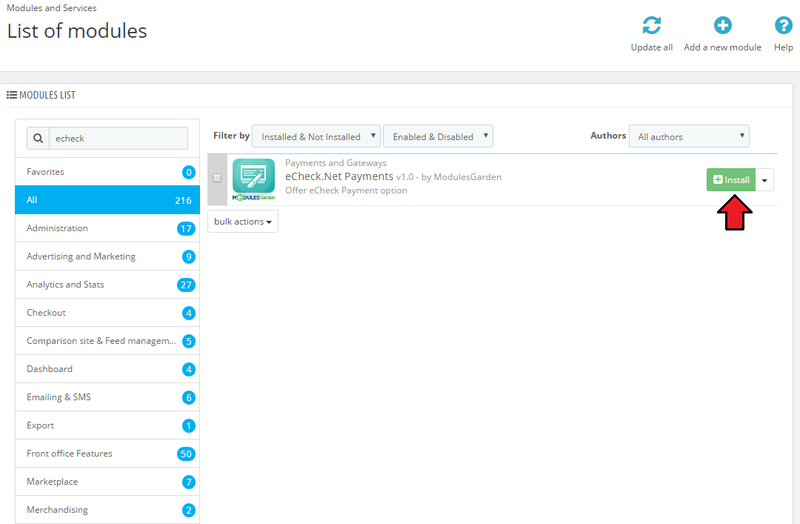 Afterwards, find 'eCheck.Net Payments' on the list of modules and install it. 7. In the next step you need to configure the payment gateway. To do so, click on 'Configure' button. 8. Provide your ID and Transaction Key to connect to the API successfully. Here you may also choose whether you want to work in a test mode - to check if everything works fine. Remember to save the changes when ready. 9. 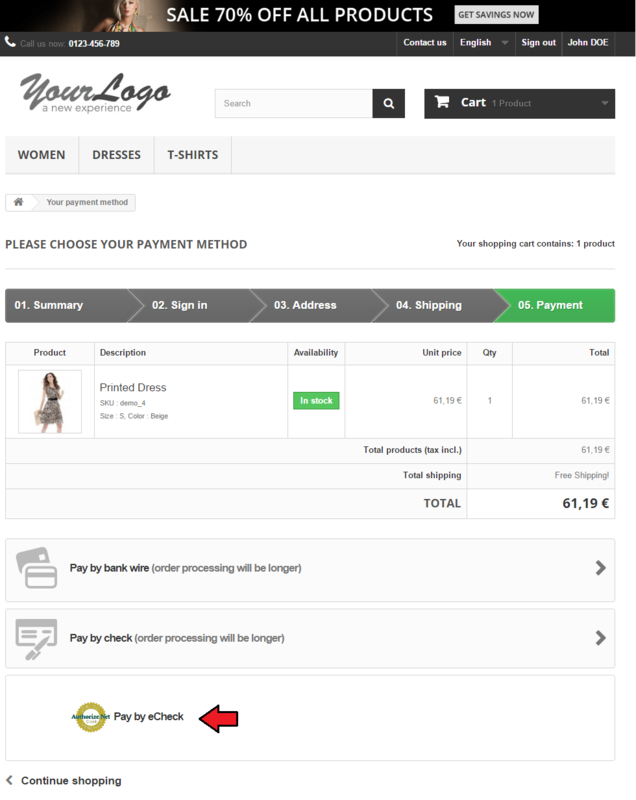 You have just successfully installed eCheck.Net Payments For PrestaShop! 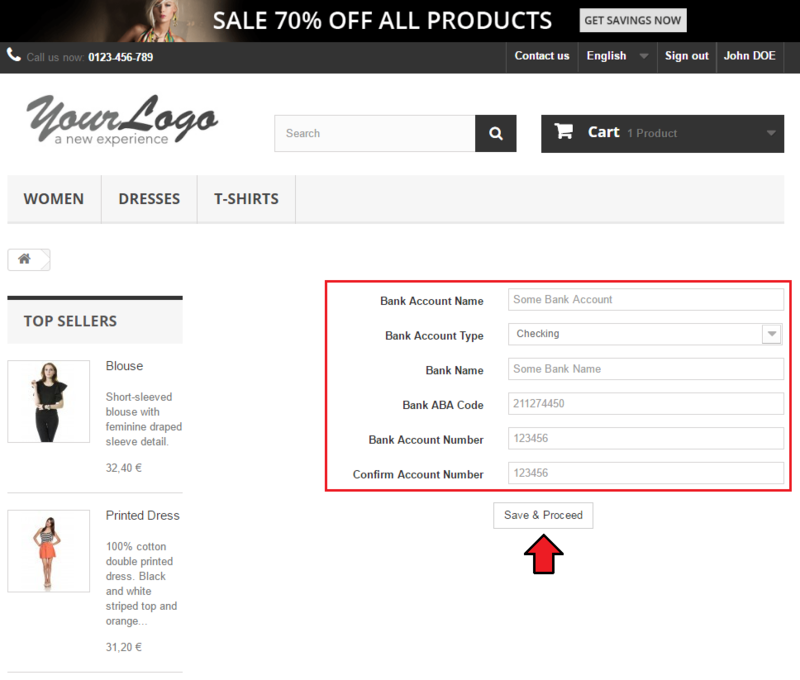 At this section we will show you the possibilities of eCheck.Net Payments For PrestaShop. Collect payments from your customers by accepting their eChecks. An exemplary item has been added to the cart. When completing the shopping you are asked to choose payment method from available. 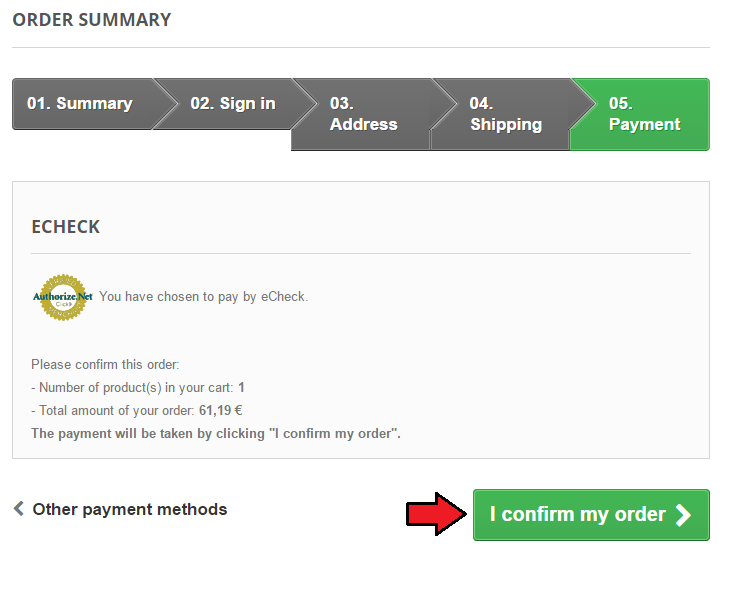 Select 'Pay by eCheck' on the order. You will now have to provide and necessary details to fulfill the payment. Note: You will have to enter these data every time you choose this payment method! 6. Confirm the account number. Save & Proceed to complete the payment. If the entered data are correct, invoice is automatically paid. 1. Please note that Authorize.net is applicable only for clients from United States.